The library, located on level 4 of the White Sands mall, is the first of its kind to have a dedicated area for teens, managed by teens. This past Saturday, the National Library Board reopened the doors to the Pasir Ris Public Library, welcoming a community of old and young alike after nine months of renovations. The library, located on level 4 of the White Sands mall, is the first of its kind to have a dedicated area for teens, managed by teens. It also hosts a bevy of new technology such as the Shelf-Sorting Robot, Self-Service Centres, Digital Book Trailer Screen, and Newspaper Reading Computer. Mr Teo Chee Hean, Deputy Prime Minister and Coordinating Minister for National Security, welcomed the community to the rejuvenated library in his opening remarks. Following his speech, Mr. Teo Chee Hean and his fellow Pasir Ris-Punggol GRC members were taken on a guided tour of the revamped facilities, paying special attention to the novel technologies integrated within the library. The NLB continues to provide its patrons with an enhanced experience through a personalised manner. NLB has several digital platforms which cater to individualizing the user’s library journey. These platforms live inside the pockets of patrons, through mobile apps, and within the confines of the library. Inside the library, patrons are greeted by a wall of tech hosting the ReadNext screens, eRead Screens, and Library Book Return Screen. The ReadNext screens display curated book recommendations to the patrons, based on their user profile and the items available in the library. The patrons may then borrow items by scanning the QR codes, using their mobile devices. eRead screens help patrons browse and borrow eBooks from the library’s collection. The patrons can borrow the digital items by scanning the QR codes, using their mobile devices. Within the confines of the library, there are 4 e-newspaper readers with access to 6 regular newspaper titles. The e-newspaper readers allow patrons who enjoy the content of newspaper titles to view them in a digital format. This allows them to zoom in and scan through the newspaper with the added benefit of the large computer screen for viewing comfort. The Pasir Ris Public Library has adopted the AutoSorter machine, an upgraded version from the one in Sembawang Public Library. The computerised system works to mechanically sort patrons’ returned items into specific categories, making it easier for staff to reshelf. The AutoSorter also uses data analytics which helps it identify popular titles for staff to place on the specially designated ‘Just Returned’ shelves. While on the guided tour, Mr. Teo Chee Hean was able to see the AutoSorter receiving books and allocating them to 3 separate holding boxes. One of the biggest jaw-droppers was the new Shelf-Reading Robot, created with the help of the A*STAR Research team. This robot is being piloted at the Pasir Ris Library to help aid the senior staff with the menial task of manually checking all of the book shelves. The robot operates during library after hours, scanning shelves and identifying titles that have been incorrectly placed. The robot then generates reports to inform the librarians of the specific shelves and titles they must attend to. When we saw the robot in action, it took a few minutes for it to adjust to the arrangement of the books on the 4 shelves. It then began lazer scanning the titles on the second and fourth shelves, keeping track of which titles were out of place. To that, Mr. Teo Chee Hean gleefully rearranged several titles to test the efficiency of the robot. A few minutes later, the A*STAR research team member handed the Deputy Prime Minister 2 book titles that the robot recognised as ‘out-of-place’. This robot is to be piloted at the Pasir Ris Public Library and NLB will continue to improve the system for rollout to other libraries in the future. 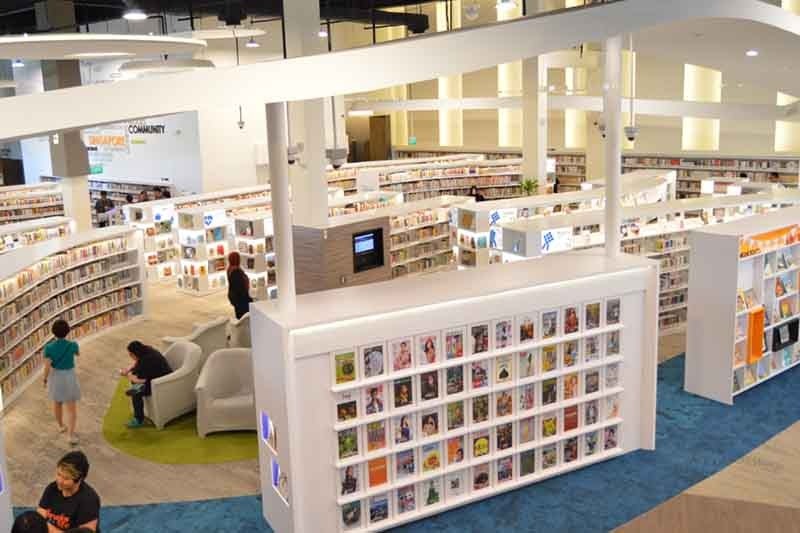 Pasir Ris boasts having the first library with an area dedicated specifically to teens. The Teens’ Mezzanine was specially designed for teens to engage in group activities, discussion, and brainstorm sessions. The space was created based on the feedback from teenagers and the public through Meet-the-People sessions and Focus Group discussions held in Pasir Ris. Some of the neat IT features include a Doodle Wall and a Digital Book Trailer screen. The Doodle Wall works with an interactive projector to allow the visualization of discussions. It acts as a sort of white board that teens can draw and scribble notes on. The Digital Book Trailer screen includes promotion videos produced by NLB and its Inspiring Readers Society. This feature provides a different and novel medium for teen patrons to engage with books. The Digital Book Trailer screen targets highly visual-focus youth patrons, a demographic which the libraries find great engagement. Mr. Teo Chee Hean was pleasantly surprised by the concept as he walked through the teens’ mezzanine. Is this what our future libraries are going to look like? The Pasir Ris Public Library is the Library of the Future. It comes to no surprise that the National Library Board was recently honored with the bronze award for the Best Innovative Use of Infocomm Technology (Public Sector) at the Singapore Infocomm Technology Federation (SiTF) Awards 2015. “The revamped Pasir Ris Public Library has created a space for teens and introduced new digital initiatives for the convenience of all library users. It will be a role model for all libraries in Singapore,” stated Dr. Yaacob Ibrahim, Minister for Communications and Information. Experiencing the Pasir Ris Public Library first-hand allowed us to realise how far we have come from the traditional libraries, characterised by wooden shelves, low ceilings, and few computers in sight.